Step aside Chris Rock, Eddie Murphy and Martin Lawrence, the undisputed reigning “King of Comedy, ” pound-for-pound, is clearly now Kevin Hart. That’s after his “What Now?” world tour during which the diminutive comedian staged 168 shows across the United States and Canada, as well as ports-of-call in Europe, Asia, Australia and Africa. The pinnacle of the 16-month standup series was an outdoor event at Lincoln Financial Field.where the Philly native son performed in front of a very appreciative crowd of 50,000 hometown fans. And the record-making turnout marked the only occasion on which a comic has ever sold out a mammoth football stadium. 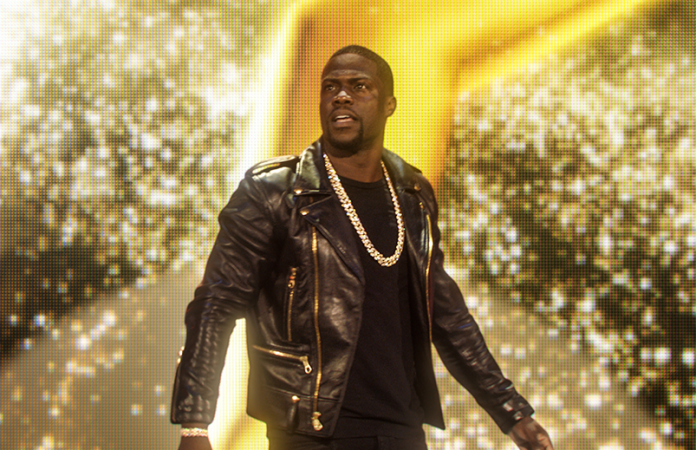 The highlights from that venue’s production were cobbled together to create Kevin Hart: What Now?, the 5′ 4″ funnyman’s fifth foray into the concert flick genre, and his first since Let Me Explain (2013). While most of the movie is ostensibly composed of the best of Kevin’s latest standup act, it opens with another one of his trademark set pieces, in this case a spoof of a famous James Bond scene from Casino Royale. Directed by Tim Story, the skit features Kevin as a suave card shark and co-stars Halle Berry as his love interest Miss Money Berry, Don Cheadle as his straight man, David Meunier as a ruthless Russian mobster, and Ed Helms as an affable bartender. The basic idea behind the bit is to have Hart amass millions in winnings at the poker table before mounting a daring escape with Halle in tow and arriving just in time in Philly to launch the proceedings. Let’s face it, comedy has become more of a challenge in this politically-correct era when formerly-favored, bottom feeding fare focusing on misogyny, homophobia and race have understandably become controversial, hot-button topics. However, Kevin has never had any trouble working with such constraints, as his observational brand of humor is mostly of an introspective nature. Instead, he continues to mostly exploit himself, milking mirth from jokes revolving around his size, his fear of being photographed while sitting on a public toilet seat, his dislike of his wife’s endless hypothetical questions, and his newfound fear of wild animals like snakes, coyotes and mountain lions which has surfaced now that he resides outside of L.A.
As Kevin himself suggests just as the closing credits start to roll, his hilarious act’s universal acceptance by the diverse audience made up of members of every ethnicity and orientation effectively delivers a timely message that if we can all laugh together, then we can all live together, too!. Rated R for pervasive profanity, the N-word, and some sexual references.